Introduction (L.F. Diaz). 2. History of composting (L.F. Diaz, M. de Bertoldi). 3. Microbiology of the composting process (H. Insam, M. de Bertoldi). 4. Factors that affect the process (L.F. Diaz, G.M. Savage). 5. 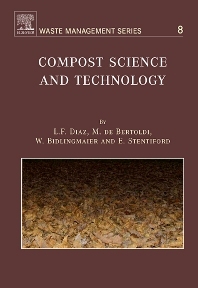 Systems used in composting (L.F. Diaz, G.M. Savage, L.L. Eggerth). 6. Design of composting plants (U. de Bertoldi-Schnappinger). 7. Quality and agronomic use of compost (F. Tittarelli, G. Petruzelli, et al.). 8. Bioremediation (G.M. Savage, L.F. Diaz). 9. Pathogenic agents (R. Böhm). 10. Suppression of soil-borne phytopathogens by compost (J.D. van Elsas, J. Postma). 11. Odor emissions from composting plants (W. Bidlingmaier, J. Müsken). 12. Marketing of composts (L.L. Eggerth, L.F. Diaz, et al.). Composting is a widely used biological process for the management of some wastes produced in communities and agricultural activities, which have experienced substantial growth during the last few years. Because this and the knowledge of composting has increased, the number of composting facilities has increased tremendously, especially in some European countries. Interest has also increased in several countries in other regions of the world. Compost Science and Technology attempts to summarize some of the most important work conducted during the last few years under one cover. The contributions to the publication are made by some of the most qualified professionals in the world and present the information in a clear and objective manner. The readers will find the information very useful and will be helpful in the design of new facilities and organic recycling programs. The manager or interested member of the community does not have to have a rigorous training in science or technology.